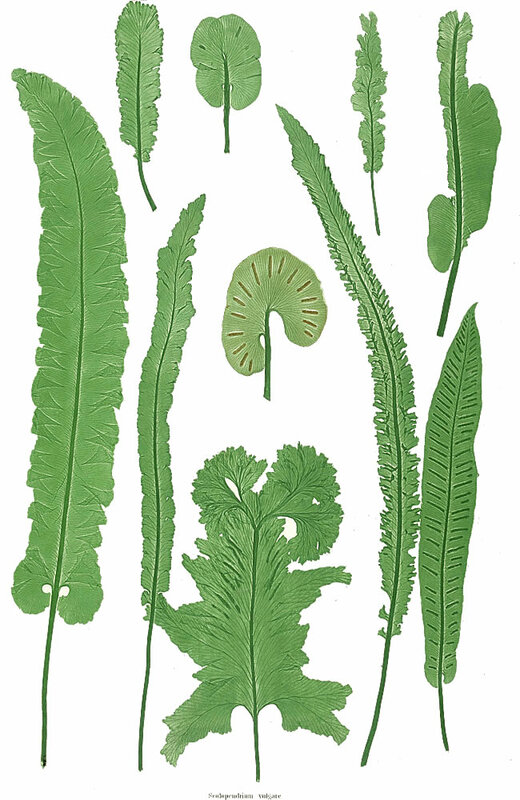 Distribution and habitat: Asplenium scolopendrium is an evergreen fern widely distributed in central and southern Europe, eastern Iran, northwestern Africa, Korea, Japan, Sakhalin and scattered populations appear in eastern North America. It occurs at sites on or near dolomite (magnesium-rich limestone) that remain consistently moist year-round such as sinkholes, cave entrances, wooded limestone ravines and talus slopes and steep north-facing slopes with rich, moist soil. Within these sites, it is typically found in microhabitats such as moist crevices, moss mats, depressions, spray zones and shady cliff margins. The common name is in reference to the supposed resemblance of the frond shape to a deer’s tongue. 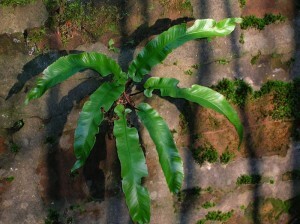 Description: Asplenium scolopendrium is commonly grown as indoor plant. Tufts of fronds unfurl from an upright, branching rhizome that lies partly above, partly below the surface of the soil. 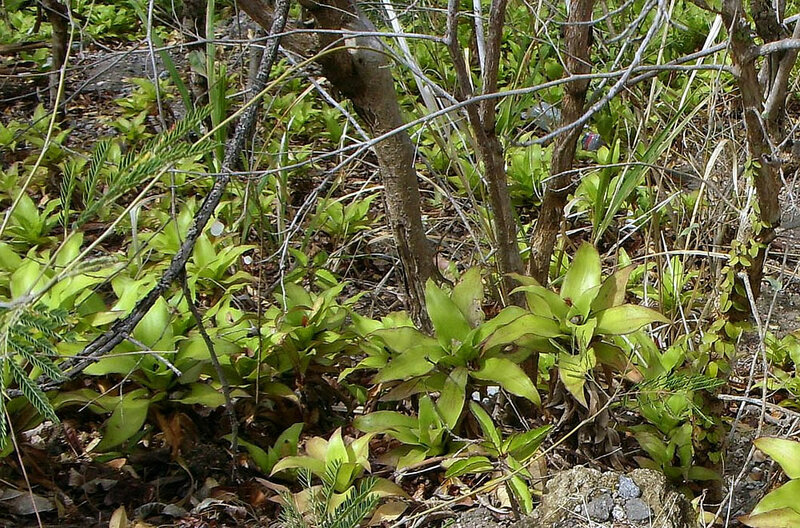 The rhizome which is covered with light brown, furry scales, is usually hidden by the fronds stalks. Depending on their age and growing conditions, the stalks are from 2 to 25cm (0.8-10 inch) long and their colour is usually black at the base shading to green at the point where they became the midrib of the bade. Frond blades are strap-like, pointed at the tip, lobed at the base and medium green in colour. 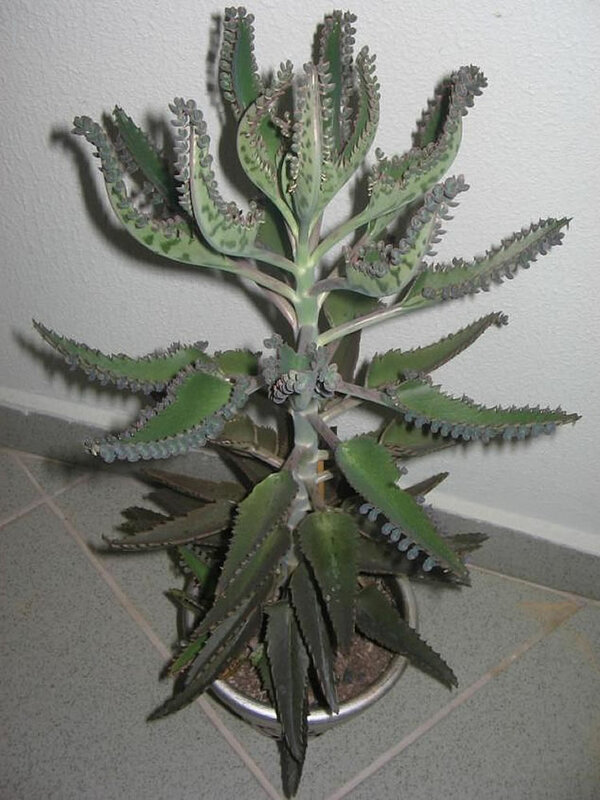 In the wild each blade can grow 50cm (20 inch) long and 13cm (5 inch) wide, but in potted plants they are seldom more than half that size. The fronds grow erect at first, but arch over as they lengthen. Spore cases grow in a herringbone pattern on the beck of the most of them. 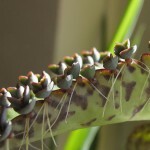 The edges of blades can be undulate and sometimes frilled and the tip of each blade can be either pointed or crested like a cockscomb. These differently shaped blades can all be present at one time on the same plant. In fact, it is this characteristic of Asplenium scolopendrium that chiefly appeals to many indoor gardeners. Asplenium scolopendrium is often grown as an ornamental plant, with several cultivars selected with varying frond form, including with frilled frond margins, forked fronds and cristate forms. 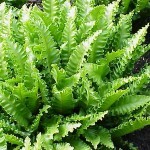 Houseplant care: Asplenium scolopendrium grow actively throughout the year under ideal condition. Growth slows down, however, during the short-day winter months. Light: Medium light is best for these ferns throughout the year. They should never be subjected to direct sunlight which will scorch the fronds. 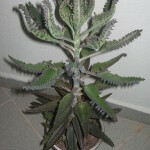 Temperature: Asplenium scolopendrium grows well in normal room temperatures and can also tolerate temperatures down to 10°C (50°F). These ferns need high humidity in warm positions. When the temperature rises above 18°C (64°F), stand the ferns on trays of damp pebbles. Watering: Water moderately, giving enough at each watering to make the potting mixture moist throughout but allowing the top centimetre (0.4 inch) or so of the potting mixture to dry out before watering again. If room temperature is allowed to fall below 13°C (55°F) for more than two or three days at a time, water more sparingly during this cool period, allowing a full half of the potting mixture to dry out between waterings. Feeding: Use half-strength standard liquid fertiliser. Frequency of feeding depends on the type of potting mixture. For plants that are potted in soil-based potting mixture monthly feedings should be adequate. 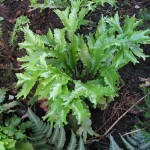 For those ferns grown in peat-based potting mixture apply fertiliser once every two weeks. Potting and repotting: Either use a peat-based potting mixture or one composed of half soil-based mixture, half leaf mould. If peat based potting mixture is used, add a tablespoon of lime chips to each cupful of mixture in order to neutralise the acidity of the peat. Repotting is necessary only when roots fill the pot. When this happens, carefully move the ferns into pots one size larger. This is best done in spring. After maximum convenient pot size – probably 15-20cm (6-8 inch) – has been reached, use these ferns for propagation or carefully cut away about one-third of the root ball and replace plants in the same pot size, adding fresh potting mixture at the same time. When repotting, always plant rhizomes vertically with half of each rhizome below and half above the surface or the potting mixture. 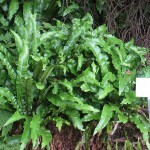 Gardening: Once planted, Asplenium scolopendrium fern grows slowly and needs little attention apart tidying in spring. 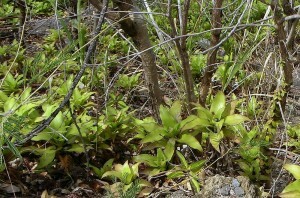 Tatty or damaged fronds can be removed in early spring as or just before the new growth emerges. Removing the old fronds prevent disease and limits lasting damage and the ferns will look tidy. 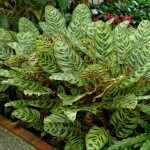 Position: Asplenium scolopendrium need a cool shady place to thrive. Plant these ferns in part shade to full shade. If grown in full sun, the ferns are yellow and stunted, while the ferns that grow under the shade are luxuriant and dark green. In alpine areas, plant them in a sheltered location where they are exposed to sun rays only during the coolest hours of the day. Soil: Asplenium scolopendrium thrives in humusy, limestone soils. It needs superior soil drainage to avoid root rot. The ideal growing conditions are a slightly alkaline well-drained but moist soil that has lots of leaf mould incorporated. In wild these ferns can be found growing with their roots in very small amounts of soil founded between rocks and crevices. This kind of environment can be replicated in the garden but ferns grown in poor conditions will be small. It is recommended to mulch annually around the plants with compost to keep the soil moisture even. Irrigation: Water Asplenium scolopendrium ferns regularly during the growing season and keep them on the dry side during the cold winter months. Keep these ferns in medium moisture without overwatering. Do not allow the soil to dry out until the ferns have become established otherwise the tips will dry out. 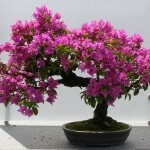 Once established, they becomes more tolerant of dry soil. Avoid watering fronds by watering straight to the roots whenever possible, not on the crown. Also watering in the morning allow ferns to dry their frond before the cold night. These precautions help to avoid crown rot. 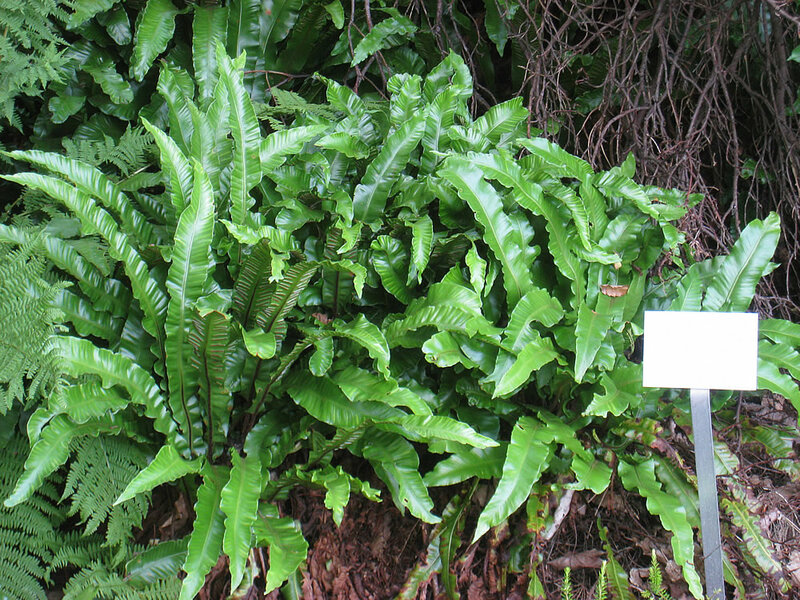 Fertilising: Asplenium scolopendrium planted in the ground, like a spring dressing of blood and bone or cow manure as well as a regular liquid fertiliser at half strength in the summer months. 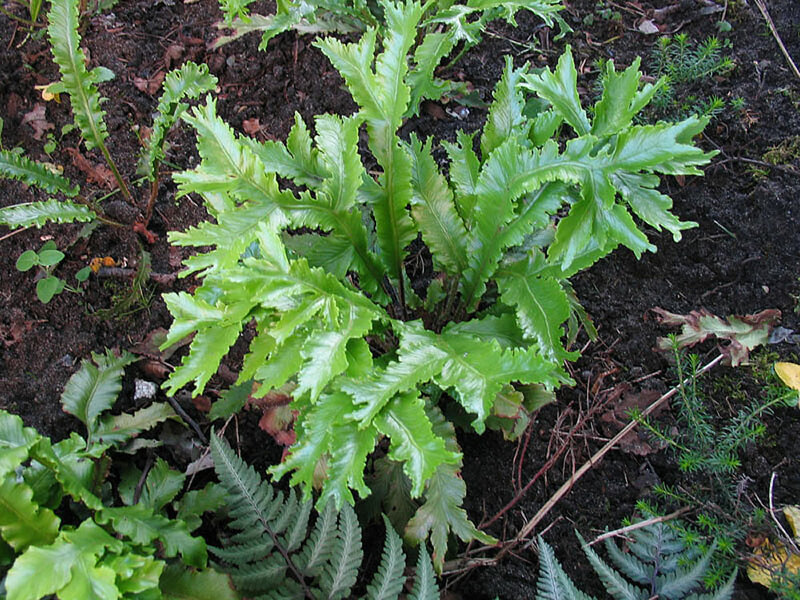 Propagation: Propagate old Asplenium scolopendrium ferns in spring by cutting off small branched of the main rhizome. Make sure that each cutting bears a tuft of fronds. Plant cuttings individually in 8cm (3 inch) pot of one of the recommended potting mixtures, only half-burring each cutting. 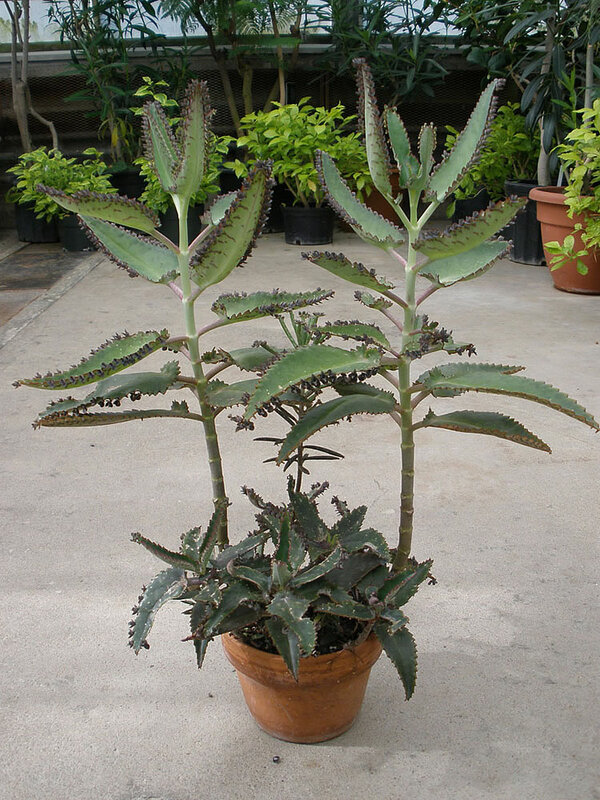 Place the potted cuttings in medium light at normal room temperatures and make the potting mixture barely moist throughout until new growth develops. Thereafter, it is possible to treat the new ferns as mature Asplenium scolopendrium ferns. These ferns may also be propagated from spores at any time of the year, best sown as soon as they are ripe on the surface of a humus-rich sterilized soil. Keep the compost moist, preferably by putting a plastic bag over the pot. 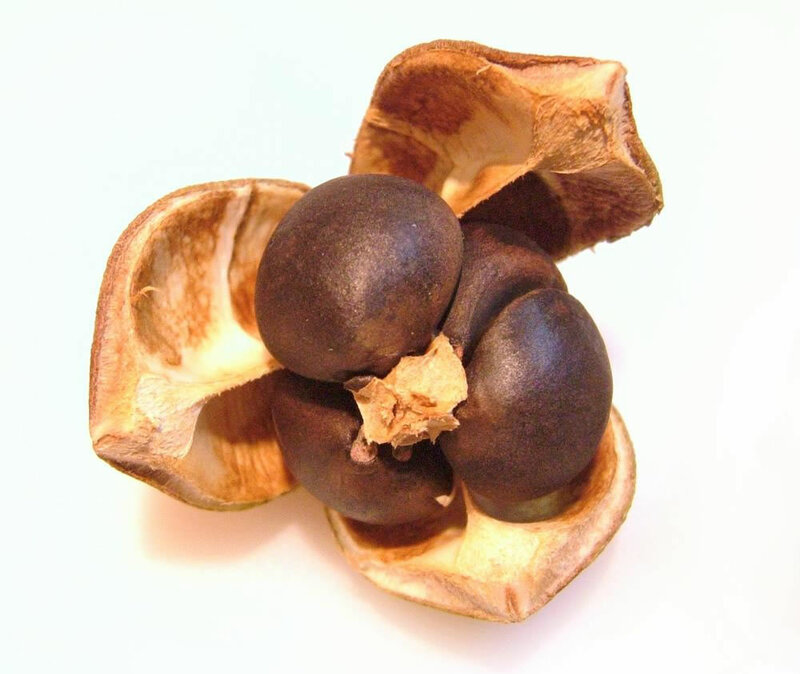 The spores usually germinate in the spring. Spring sown spores germinate in 1 – 3 months at 15°C (59°F). 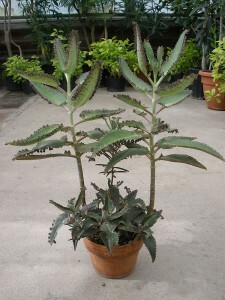 Pot on small clumps of plantlets as soon as they are large enough to handle and grow them on in light shade in a greenhouse. Keep the plants humid until they are well established. Once the plants are 15cm (6 inch) or more tall, plant them out into their permanent positions in the spring. Root rot can be a problem in poorly drained soils. Also crown rot may appear when the crown is wet in cold conditions. Treatment: Apply a suitable systemic fungicide and clear all debris away from the crown to facilitate good air circulation. Greenfly and blackfly are rare in the garden; they are more likely to occur on ferns grown indoors or in greenhouse. Capsids are graze the frond creating tiny white blotches at random. Treatment: Apply a suitable insecticide as indicated on the label. 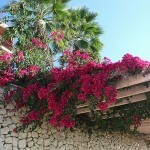 To avoid scorching, spray in evening when there is no risk of the sun burning the damp fronds. Slugs and snails are sometimes attracted to the thicker textured fronds of Asplenium scolopendrium ferns. Treatment: Use a snail and slugs pesticide to prevent and control them. Vine weevil grubs are a common pest, their grubs eating any part of the ferns, usually starting with the roots and moving to the leaf base. Vine weevil is common in gardens, but rarely cause any problems outdoors; it is with pot grown plants the real damage done. Typically eelworm damage is seen as dead patches of fronds confined by larger veins. Treatment: Control is just about impossible. It is best to remove fronds suspected of being infected as soon as possible. The problem is most likely to occur in damp, humid conditions. Asplenium scolopendrium with frond blade margins or tips that are non-variable in shape. Asplenium scolopendrium ‘Capitatum’ has fronds blades with undulating edges and heavily crested tips. 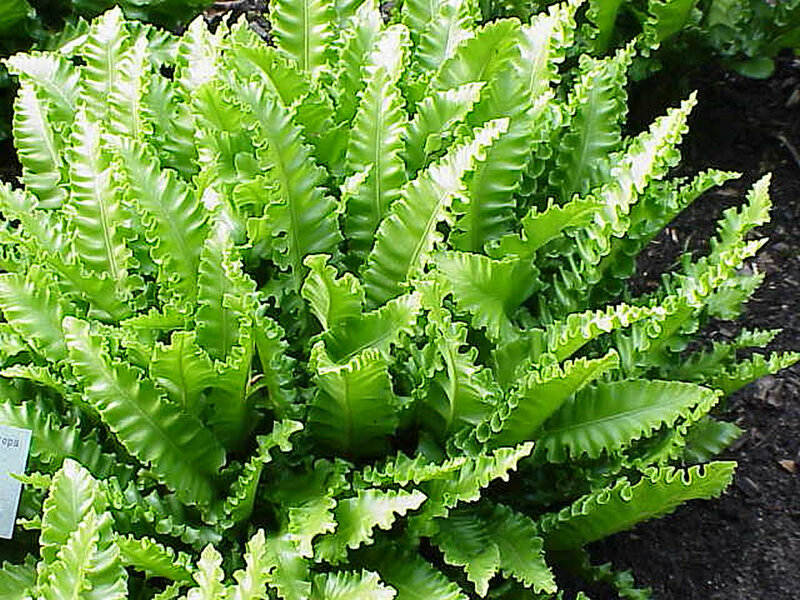 Asplenium scolopendrium ‘Crispum’ has deeply indented and greatly undulating or frilled edges (like an Elizabethan ruff) with simple pointed tip. Asplenium scolopendrium ‘Crispum cristatum’ has frond blades with crested tips as well as very frilled edges. Note: Asplenium scolopendrium has been placed in a segregate genus Phyllitis. Asplenium scolopendrium forms hybrids with other Asplenium species, including those species sometimes classified in the separate genus Camptosorus, which is one reason that both Phyllitis and Camptosorus species are now generally included in Asplenium. On the other hand, a recent phylogenetic study of the Aspleniaceae family suggests that Asplenium scolopendrium is only distantly related to other Asplenium species and that the genus Phyllitis should again be recognized. Companion plants: The tall vertical straps of the Asplenium scolopendrium fern are perfect partners for the rounded foliage of the small-leaved Hosta species. Wide clumps of the Asplenium scolopendrium look particularly good underplanted with the variegated foliage of Hosta ‘Ginko Craig’. Ferns grow well together and those with more delicate foliage associate successfully with the leathery fronds of Asplenium scolopendrium. Uses and display: Asplenium scolopendrium fern grows wild in shaded areas, often forming large drifts under trees amongst rocks and streams where its upright pointed tongues contrast strikingly with the softer shapes of damp-loving wild flowers. In gardens, these evergreen ferns are good for shaded wild gardens and are also invaluable for year-round interest amongst shrubs or other shade and moisture-loving perennials. In decorative groupings the unusual shape of these ferns, along with their fresh colouring, makes an interesting contrast with flowering plants. 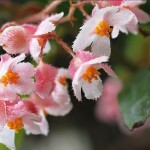 It makes a good selection for shady areas of limestone rock gardens, alpine and shade gardens or for edging in a moist woodland garden. 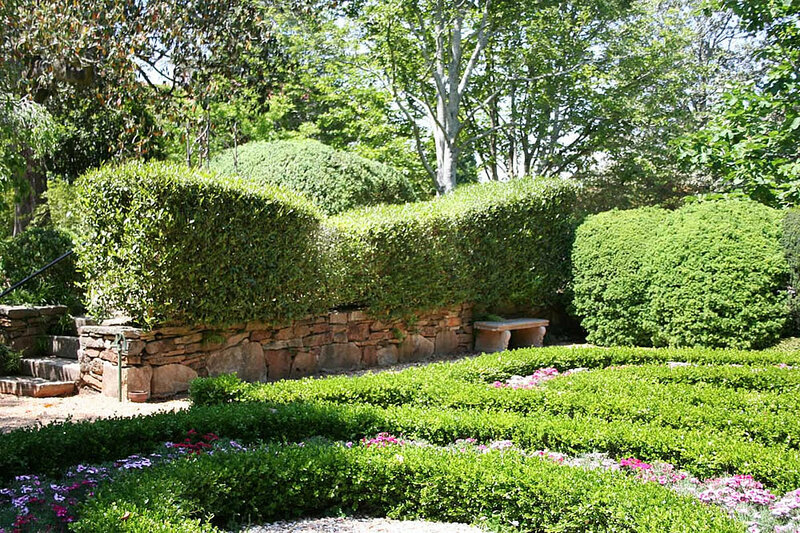 It is also valuable for adding vertical interest towards the front of a partially shaded border or for underplanting established trees and shrubs. 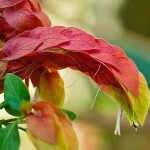 Distribution and habitat: Justicia brandegeeana is an evergreen shrub native to Mexico and also naturalized in Florida. 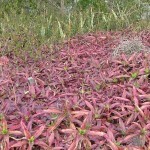 It is a sprawling, suckering, tropical evergreen shrub which grows to 1m (3 feet) tall (rarely more) with spindly limbs. 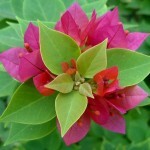 This shrub is cultivated for its very decorative flowers and long lasting flowering season. Pollination is usually by hummingbirds. 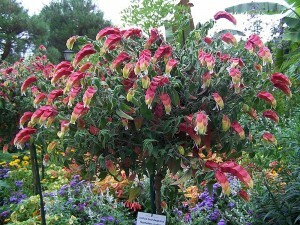 Description: Justicia brandegeeana is a perennial shrub and will last for several years. 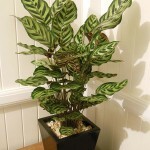 It has become a quite common indoor plant. 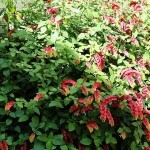 It is popularly known as Shrimp Plant because of its drooping, shrimp-like flower spikes. 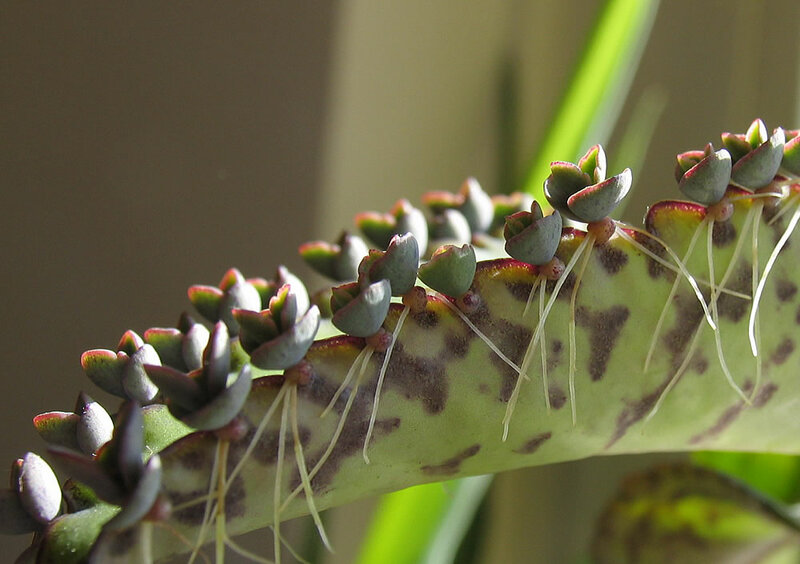 The most prominent parts of these spikes are terminal bracts, which are heart-shaped, reddish brown or pink and up to 2cm (0.8 inch) long. The bracts almost conceal white flowers that protrude from between them. The 10-13cm (4-5 inch) long flower spikes are produced continuously during the growing season, which lasts for as much as 10 months a year. 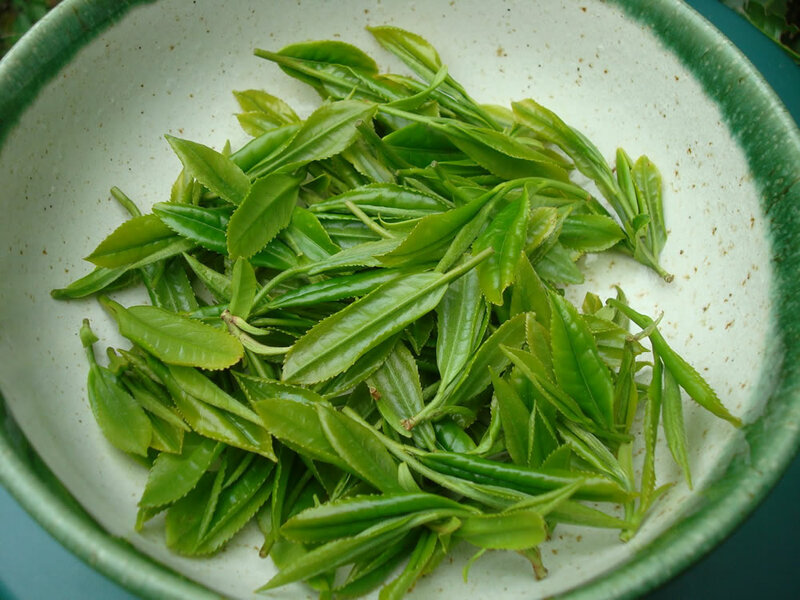 The leaves, which have 2-3cm (0.8-1 inch) long leaf stalk and are carried on upright woody stems, are 2-8cm (0.8-3 inch) long, oval, fresh green and slightly hairy. 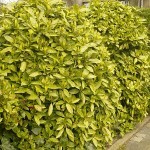 Unless Justicia brandegeeana is kept well trimmed, it tend to become a rather untidy shrub; also, if it is left alone, it usually grows over 60cm (24 inch) tall. It therefore needs cutting back annually if it is to hold its shape and retain a manageable size at the same time. This shrub is expected to last for 10 to 20 years. Houseplant care: Justicia brandegeeana thrive in containers and survive well as houseplants with a long flowering season. 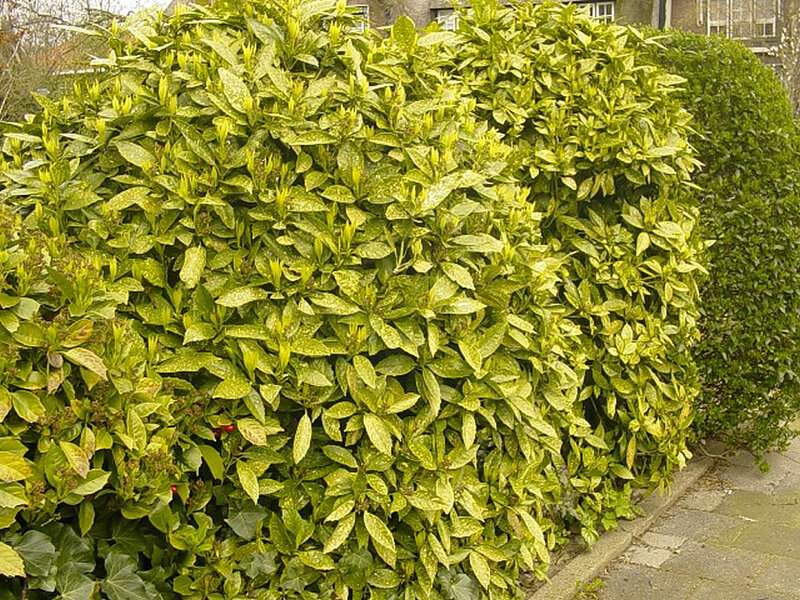 Apart from periodical pinching out of growing points to encourage bushy growth, mature Justicia brandegeeana require cutting back annually. Cut away up to half the top growth (down to any leaf axil) just as the plant is beginning to make new growth in the spring. Light: Bright light with some direct sunlight is essential for satisfactory production of the colourful bracts. Temperature: Normally warm room temperatures suit Justicia brandegeeana plant, but too much heat makes for soft and spindly growth. The recommended winter temperature is 18°C (64°F). Watering: Water Justicia brandegeeana sparingly – enough to make the potting mixture barely moist and allowing the top two-thirds of the potting mixture to dry out between waterings. Feeding: Feed Justicia brandegeeana plants from late winter to early autumn only using standard liquid fertiliser once every two weeks. Potting and repotting: Use a soil based potting mixture with the addition of a one third portion of peat moss. Move these plants into pots one size larger every spring until the maximum convenient size – probably 15cm (6 inch) – have been reached. 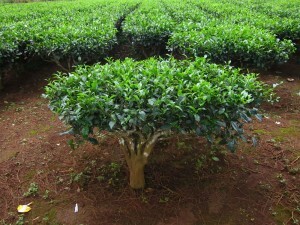 Thereafter top dress the plant annually with fresh potting mixture. 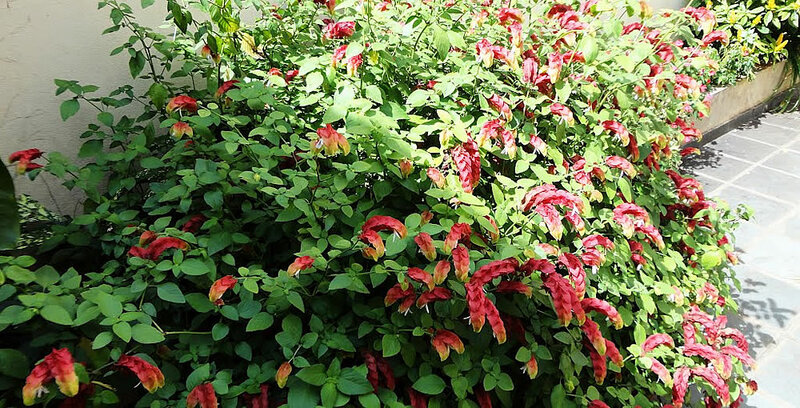 Gardening: Justicia brandegeeana is winter hardy to hardiness zones 9 to 11. Roots may survive in zone 8. Frosts will kill it to the ground, but it comes back in spring. 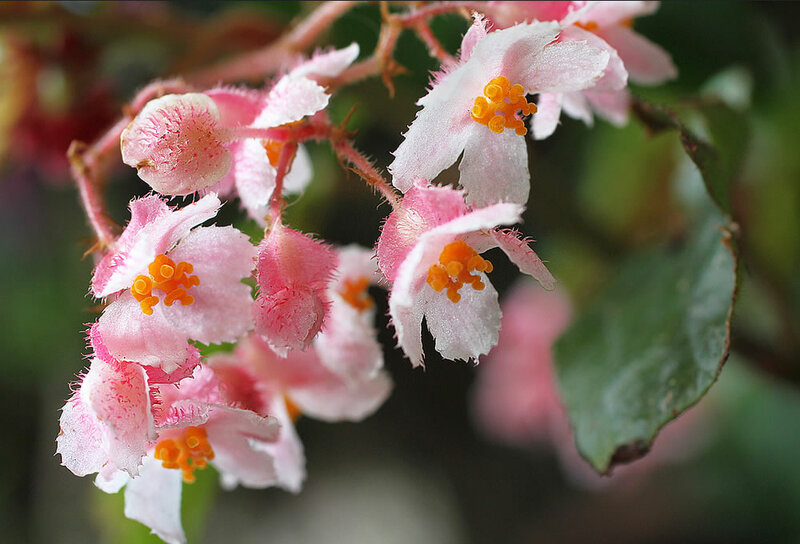 As it dislikes temperatures below 7°C (45°F), it is best grown under glass in cooler temperate areas, where it is excellent as a potted houseplant, owing to its ability to tolerate low light and some neglect. The plants grown in containers may be overwintered in a warm sun room or watering can be severely reduced to force plants into dormancy for winter storage in a dark, cool, dry location. 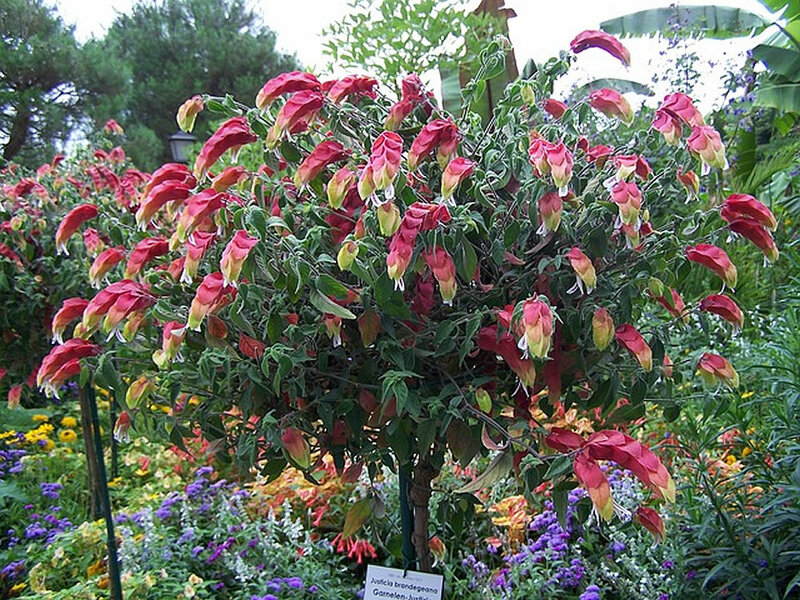 Alternatively, Justicia brandegeeana can be treated as a fast-growing annual plant in hardiness zone 9 or colder. 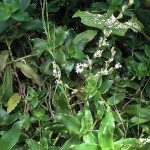 The shape is generally long and spindly. If trimmed back regularly, it can maintain a bushy habit and will not need support. If the branches are allowed to grow long, they will become unable to support themselves and sag towards the ground. 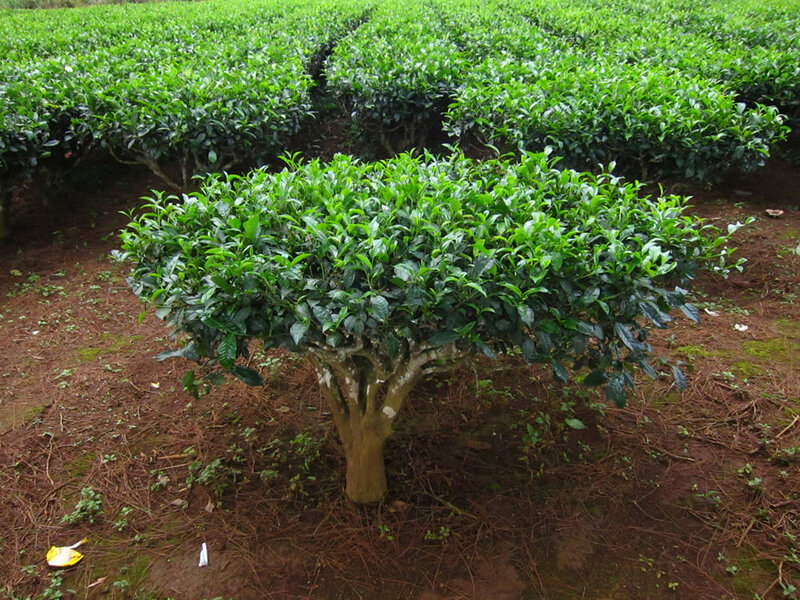 Prune annually after flowering for a more compact, formal appearance and to encourage branching. 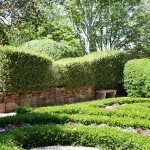 Keeping the shrubs tip pruned will promote fullness as well as increase flowering. 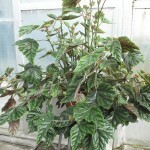 These plants grow quickly and may form buds in the first year. Position: Justicia brandegeeana can handle a variety of environments, more sun on the coast, more shade inland. 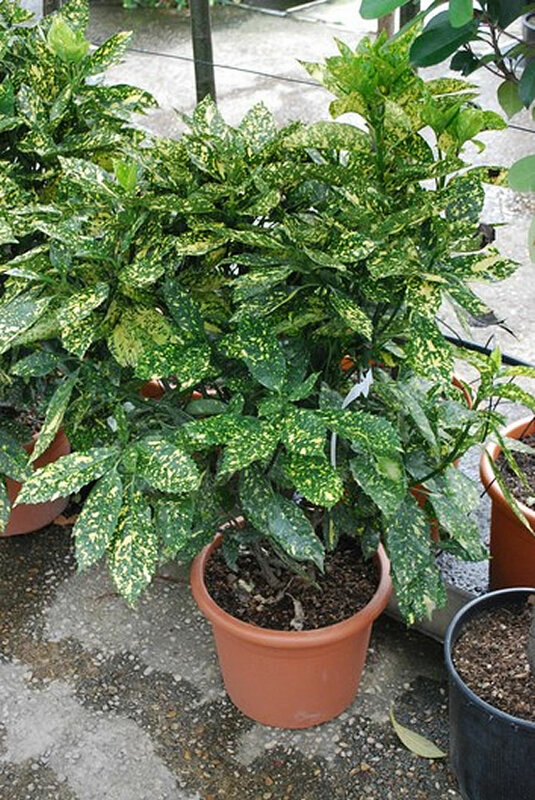 Plant it in full sun to partial shade in sheltered, frost free spot in cold climate. 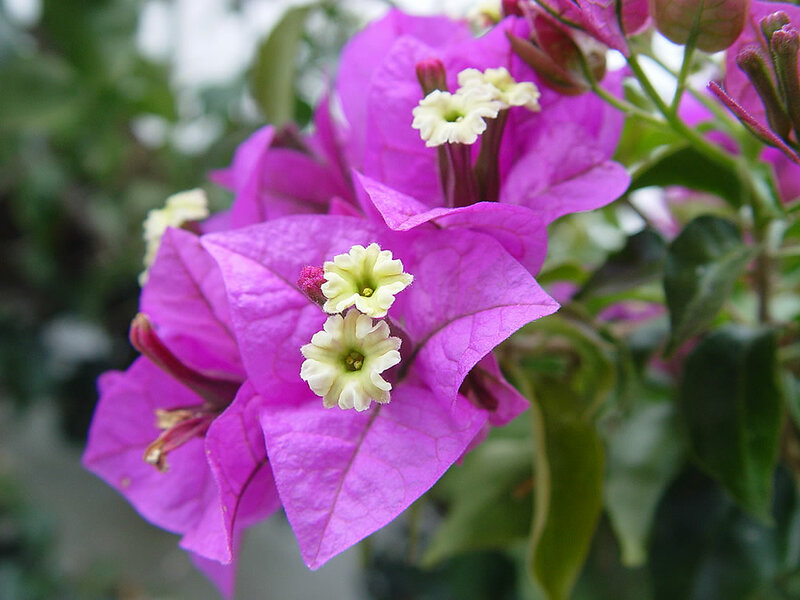 The colourful flower bracts tend to bleach out in full sun, so these plants are generally best grown in part shade with some protection from hot afternoon sun. Bright light with some direct sun is ideal for bloom formation. 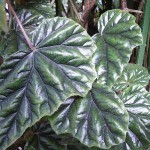 This plant thrives in the shade in tropical areas. 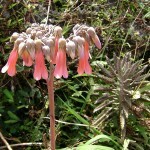 Soil: Plant Justicia brandegeeana outdoors in fertile, moist, well-drained soil. 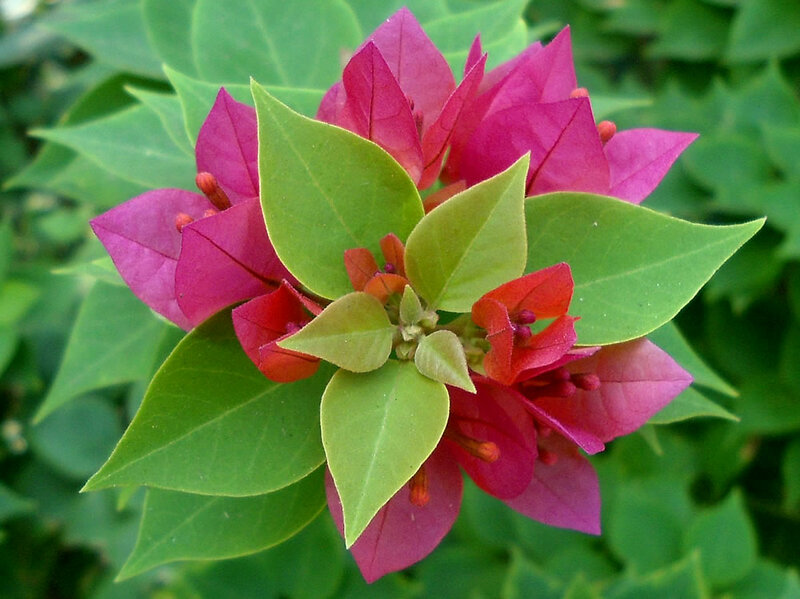 It does best in well-drained sandy or loamy soil, but will tolerate most soil types which drain well. Irrigation: Follow a regular watering schedule during the first growing season to establish a deep, extensive root system. Keep soil evenly moist from spring through fall. Allow to stay only slightly drier in winter. Fertiliser: Feed with a general purpose fertiliser before new growth begins in spring. Propagation: Tip cuttings 5-8cm (2-3 inch) long will root easily in spring. Insert each cutting in a small pot containing a moistened mixture of equal parts of peat moss and coarse sand or perlite. Enclose the pot in a plastic bag and keep it in a bright filtered light. Rooting should occur in six to eight weeks. 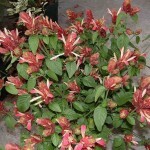 To produce a bushy plant, pot three or four cuttings together in the recommended potting mixture for mature Justicia brandegeeana. Water sparingly and do not move the pot into direct sunlight for another month or two. Yellow leaves are caused by overwatering. Treatment: Allow the soil to dry out almost completely before watering again and always use a pot with a drainage hole to prevent soggy soil. Water less in winter. Leaves may drop if soil is either too wet or too dry. Treatment: Test the soil by pushing a stake into the potting mixture. If the stake is dry, the plant should be watered. If the stake is too wet can be caused by poor drainage, cool conditions and oversized pots. 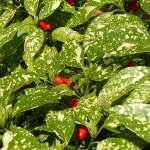 These plant are susceptible to fungal leaf spot and rust. 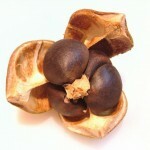 Treatment: Apply fungicides and repeat the treatment as directed on fungicide instructions. 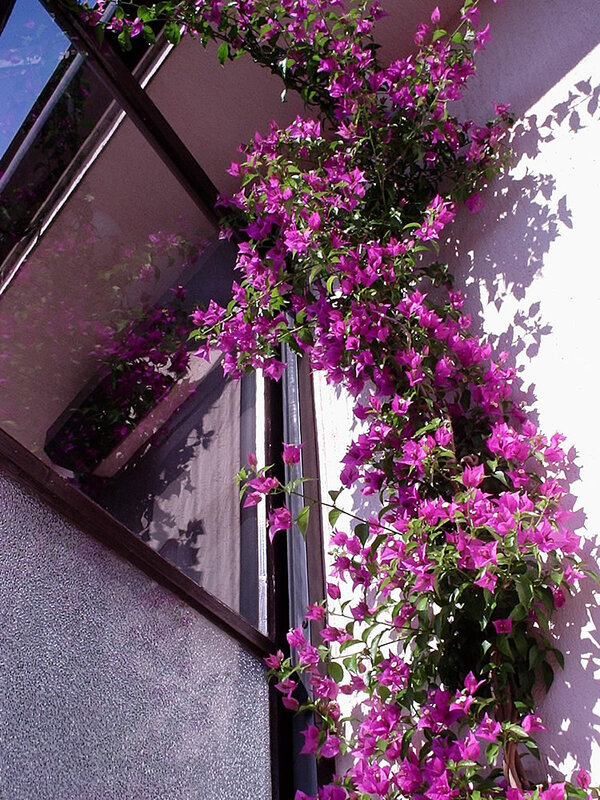 Provide adequate air circulation and water the plants in the morning, so plants get a chance to dry out during the day. Watch for whiteflies and spider mites, particularly when grown indoors. 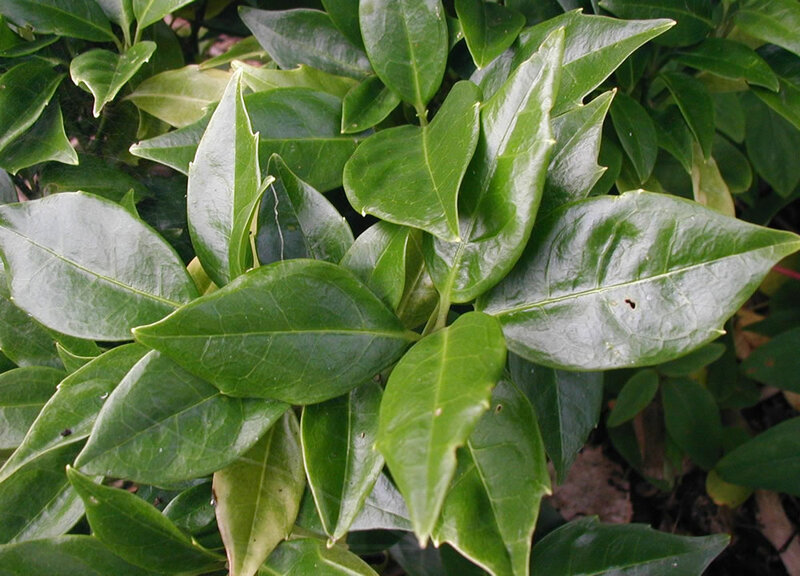 Treatment: Successive sprays of insecticidal soaps or white oil will eradicate whiteflies infestations. For spider mites, spray with a suitable insecticide and raise the humidity by standing the pot on a saucer of moist pebbles. Justicia brandegeeana are prone to become leggy plants. 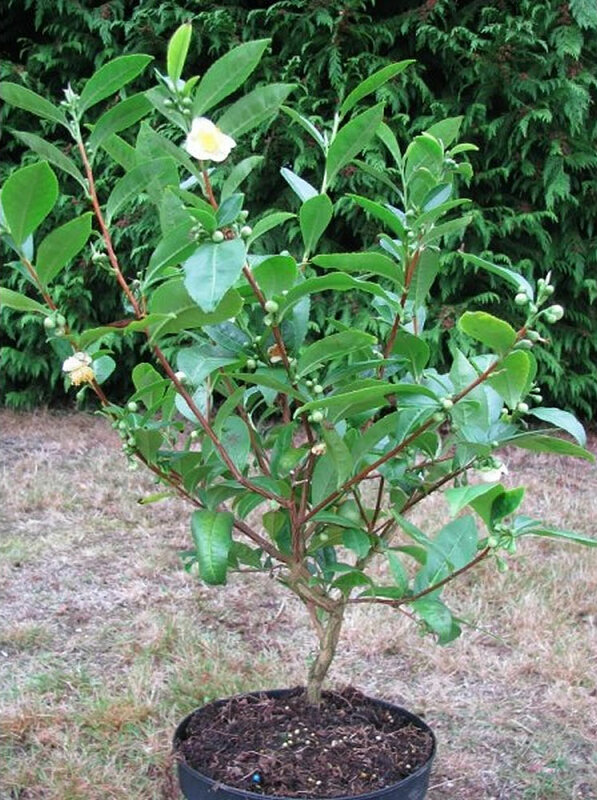 Treatment: Constantly pinch and prune, start new plants from cuttings. 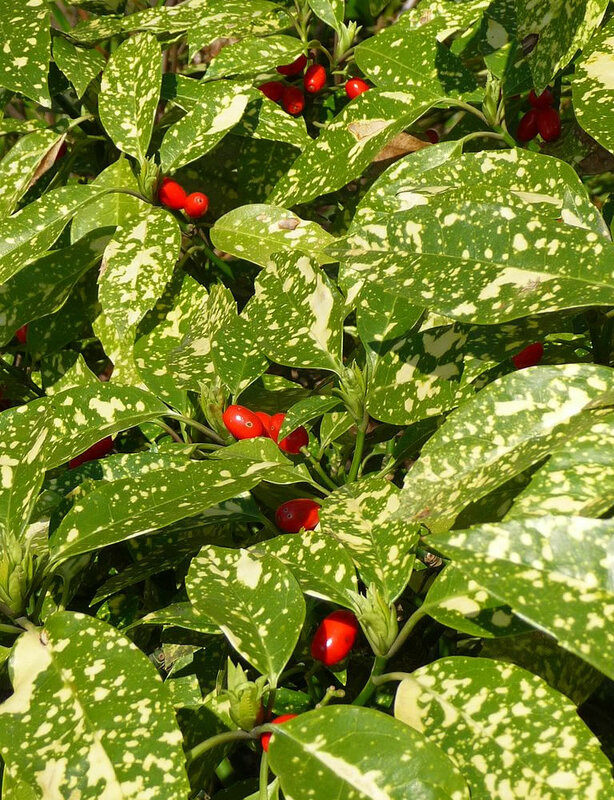 Pale leaves is usually caused because the plant is lacking food. Drop or pale flower heads is because the plants need more light. Treatment: Move the plants to a brighter location. Justicia brandegeeana cv. 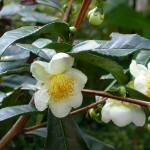 ‘Yellow Queen’ is a rarer form with yellow bracts. Justicia brandegeeana cv. 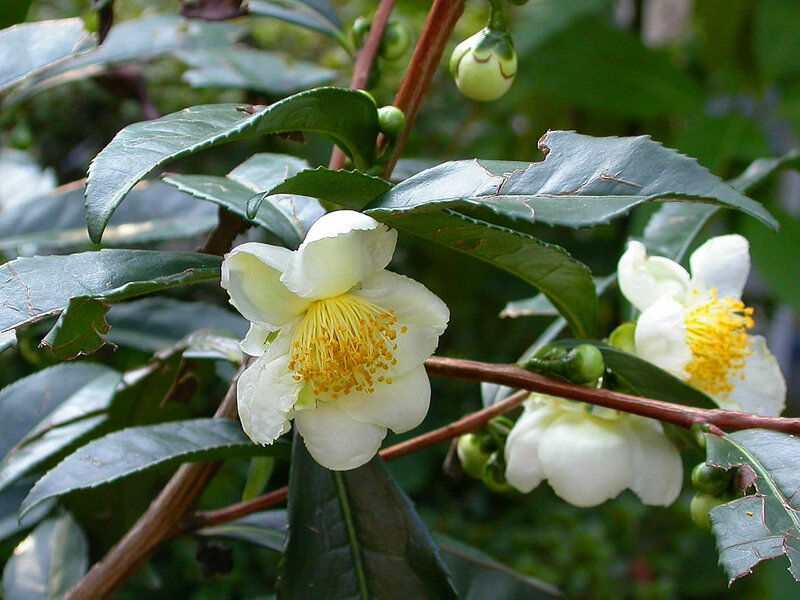 ‘Fruit Cocktail’ has yellow and green bracts with pink flowers. 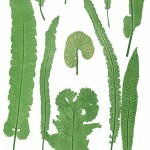 Companion Plants: In a location with filtered shade, plant near an exotic fern, such as the Dicksonia antarctica (Tasmanian Tree Fern) or groundcover Nephrolepis exaltata (Sword Fern). 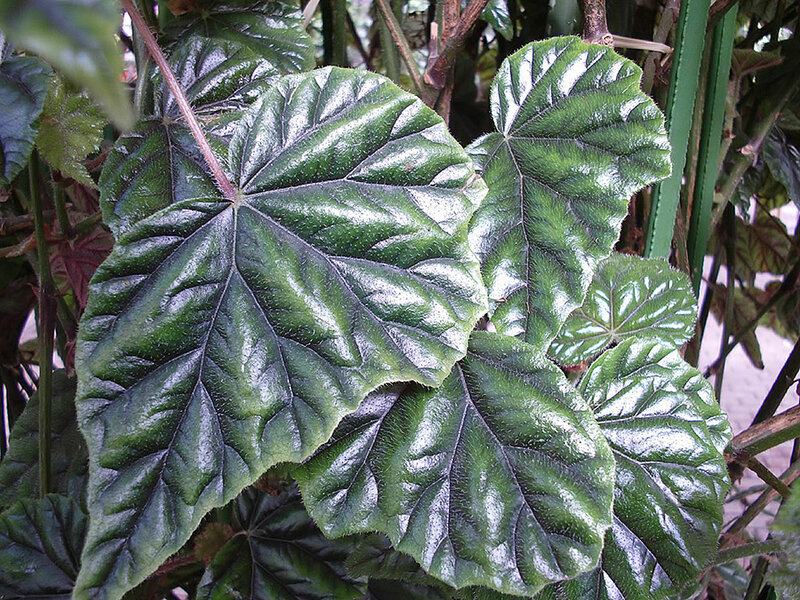 Can also be used to cover the unattractive base of tropical foliage plants, such as Ensete ventricosum (Abyssinian Banana) or Philodendron x ‘Xanadu’ (Xanadu Cut-Leaf Philodendron). 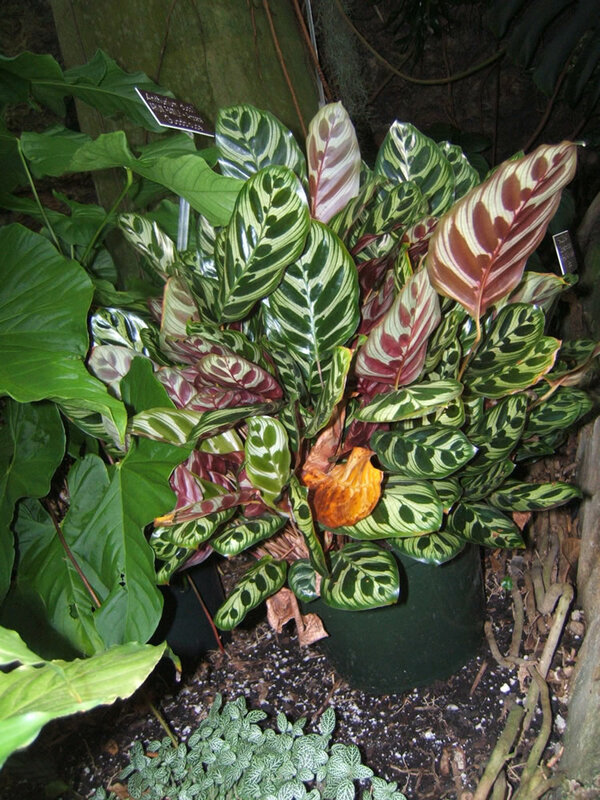 They can be folded in among Zingiber (Gingers), Musa (Bananas) and Canna species (Cannas) for a contrasting look. Also Justicia brandegeeana can be associate with Begonia (Begonias), Porphyrocoma pohliana (Brazilian Fireworks) or Curcuma longa (Curcuma). Uses and display: Justicia brandegeeana are grown as ornamentals in tropical and subtropical gardens and as conservatory plants in temperate areas. These showy perennials are good plants for mixed borders and beds where they produce masses of ornamental flowers. 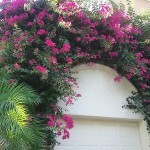 These plants are great display anywhere a splash of continuous colour is needed since they bloom almost all year long. 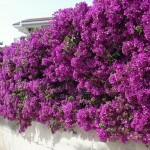 They will display the best color when planted in a bright location that receives direct sunlight. 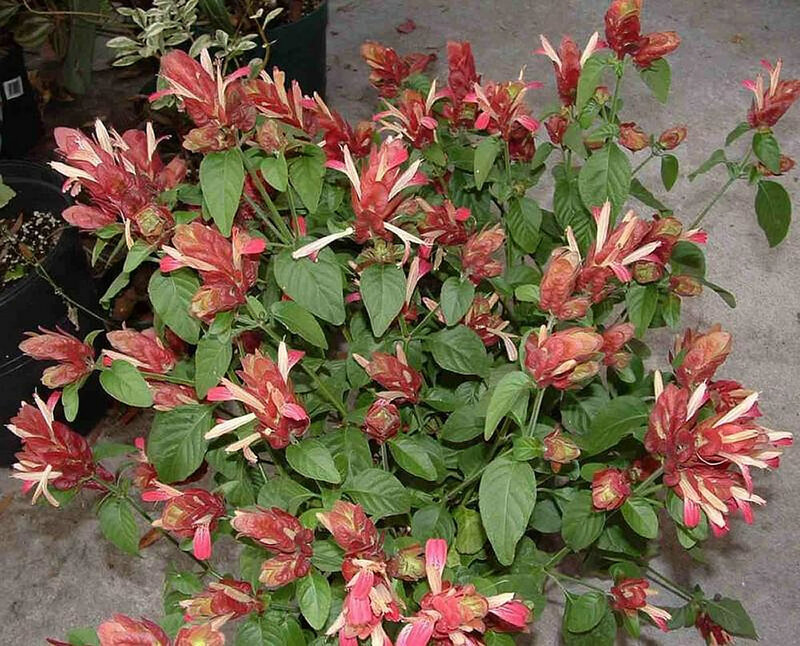 In cooler climates, Justicia brandegeeana plants can be grown in containers and brought indoors for overwintering. Although featured this striking plant in the garden, Justicia brandegeeana can be used in different settings. 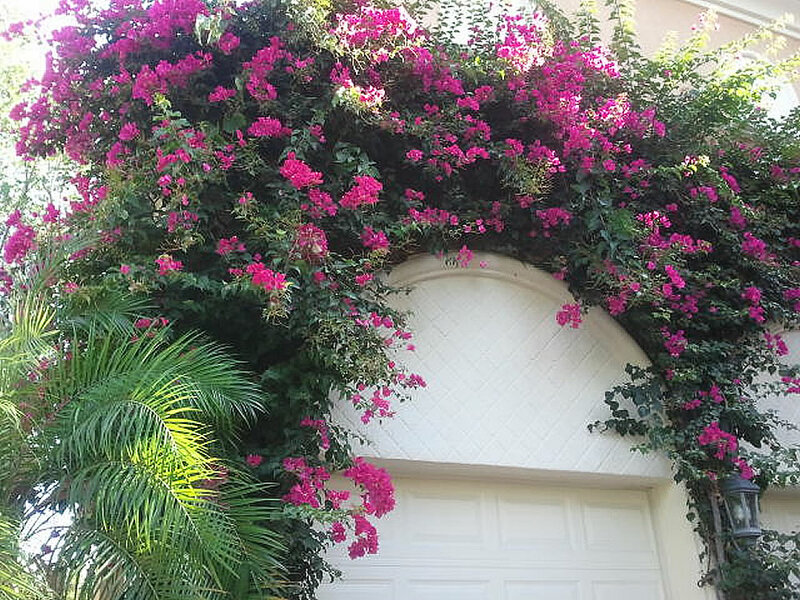 Their lush foliage and distinctive flowers make them a natural for a tropical garden. 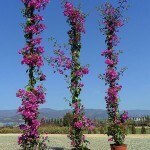 They are also showy and long-blooming enough to feature by themselves in a large container or as a focal point in a part-shade location. Distribution and habitat: Alpinia vittata is a species of flowering plants in the ginger family, native to a region from the Bismarck Archipelago in the Solomon Islands. 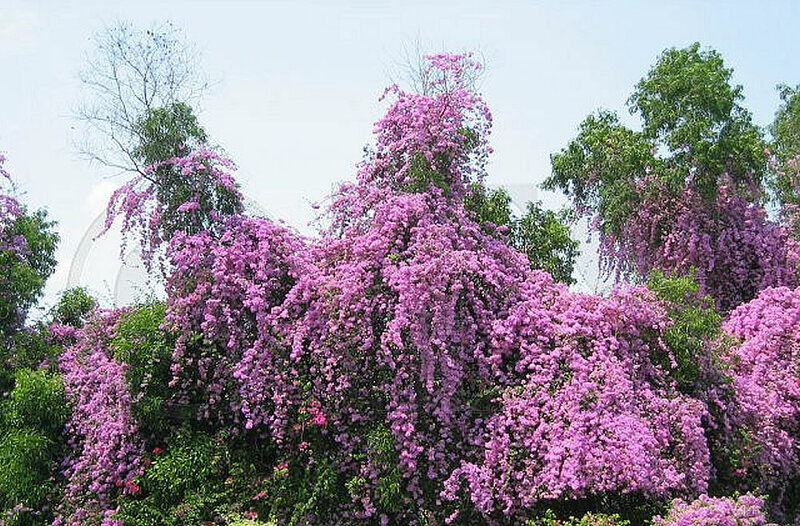 They are evergreen rhizomatous soft-wooded perennial cultivated as ornamental plants. 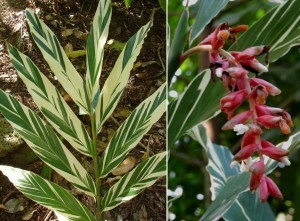 Alpinia vittata are plants of forest understory habitat in hot and moist climate all year round. 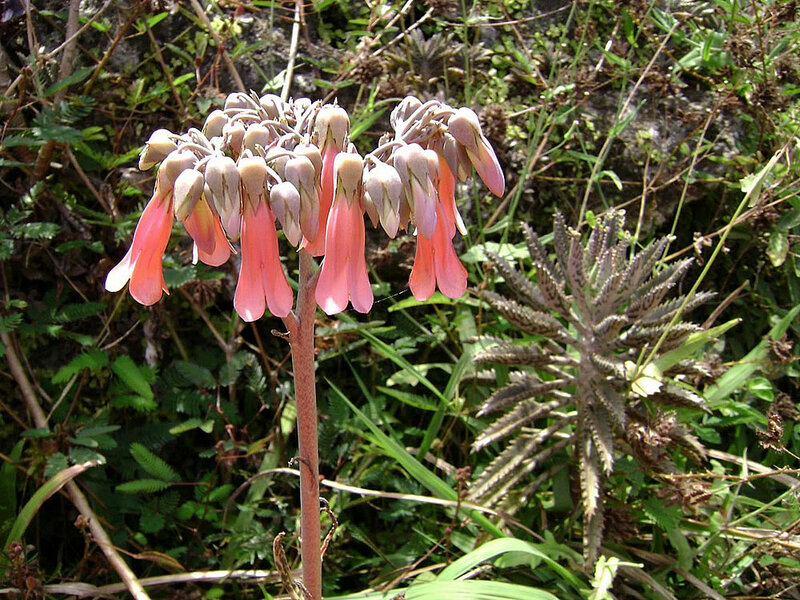 This plant is among the most attractive and commonly grown species of this genus. Description: Alpinia vittata is a tropical, clumping perennial plant that grows from a rhizome. 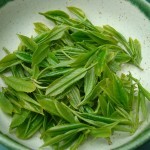 The stems are pseudo-stems – they are made up of many layers, which are leaf sheaths, tightly compressed together. 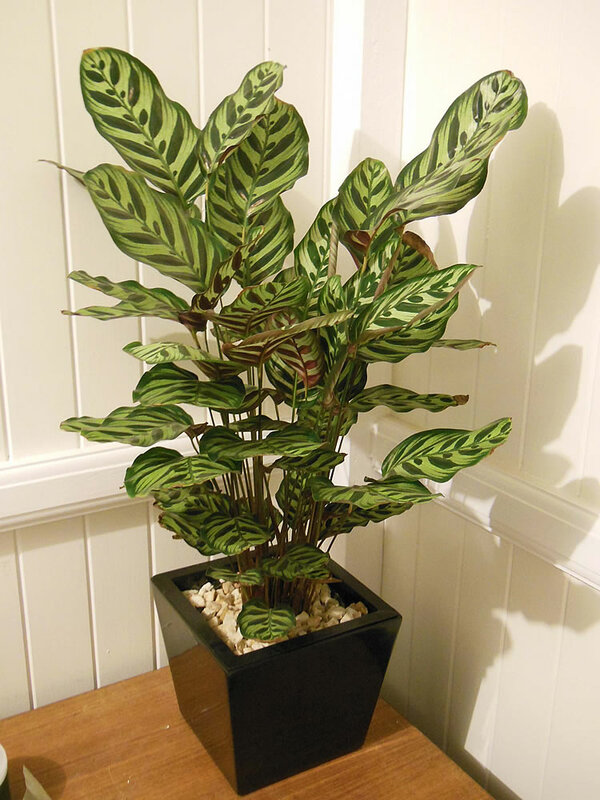 It is growing up to 50cm (20 inch) tall indoor and has green pale, 20cm (8 inch) long leaves edged and banded from the centre to the margin with cream or white stripes. 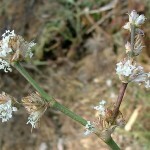 The leaves are more or less lance-shaped, arranged in two ranks on the reed-like pseudo-stems. 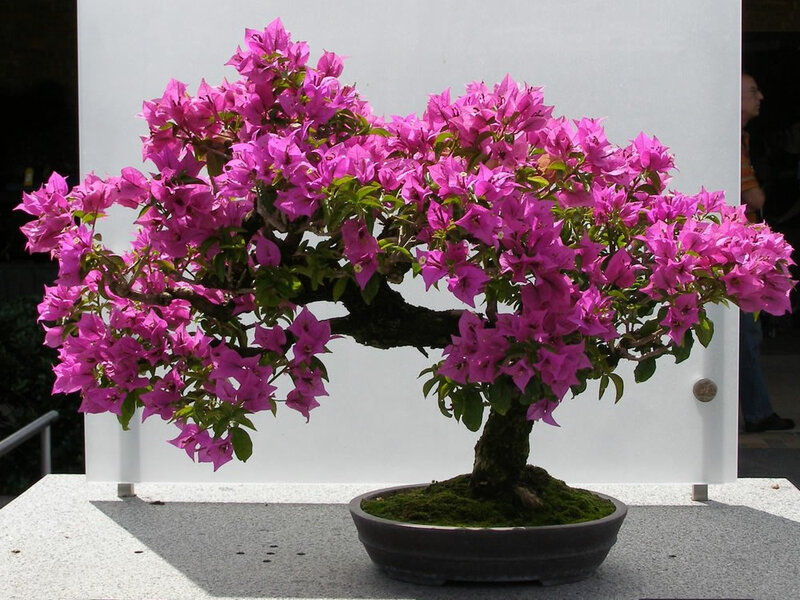 These plant rarely flower in cultivation. 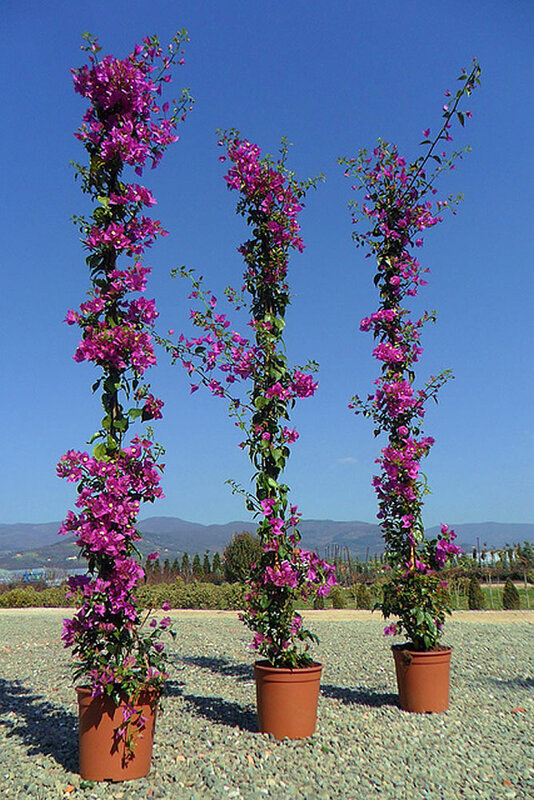 In the ground in warm climates it can grow to 1.5m (5 feet) tall or more, but tends to stay smaller if grown in pots. It forms a dense clump that makes a good accent plant. Large clumps produce pendulous pink flowers. Inflorescence are 18-25cm (7-10 inch) long. 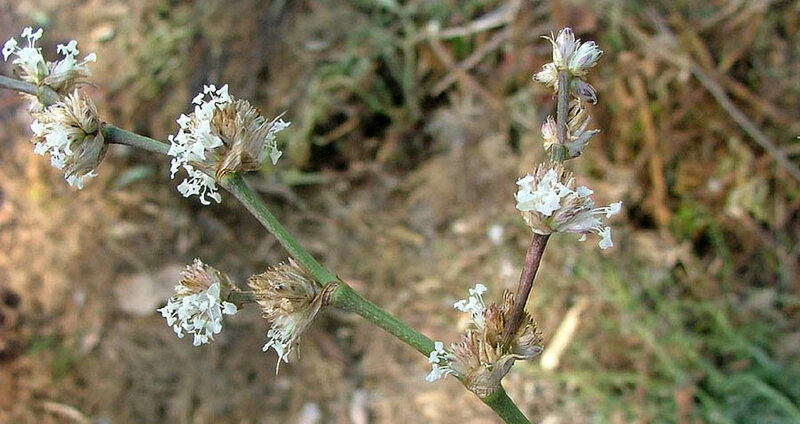 They form only on two years old stems consisting in a pendant branched spike carried terminally on a leafy stem. 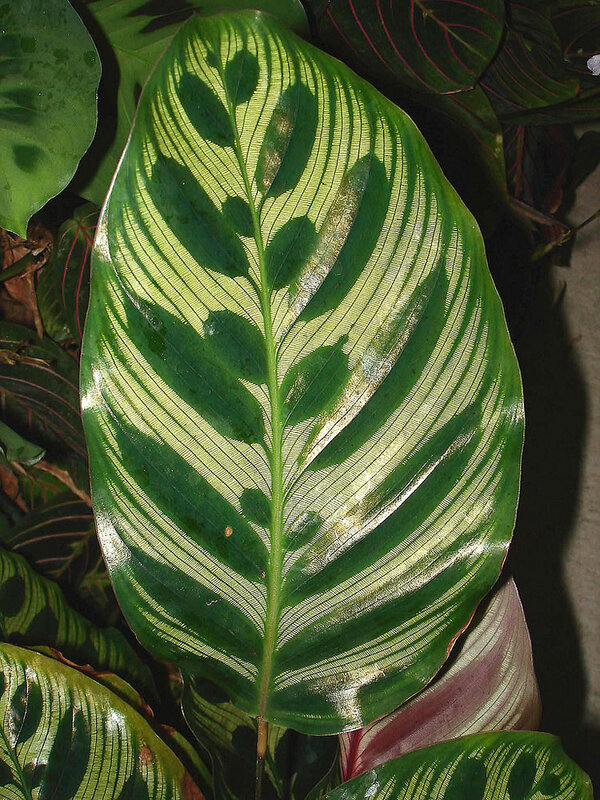 Alpinia vittata is cultivated mainly for its beautiful and striking foliage. 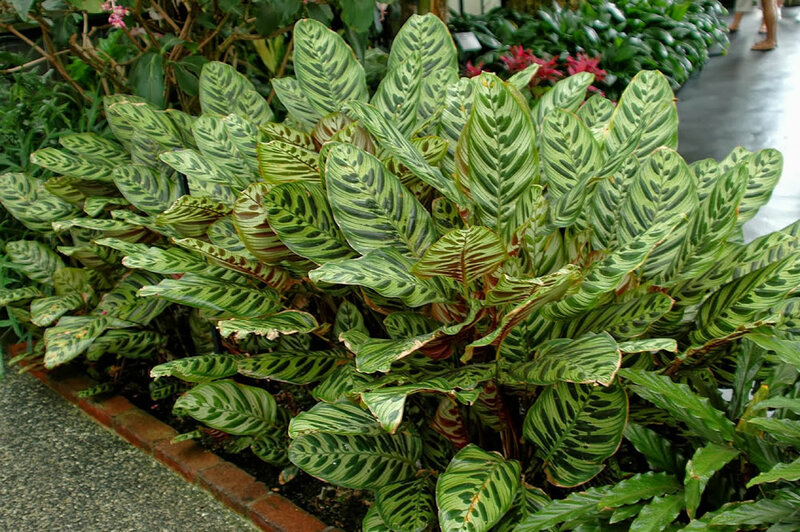 Houseplant care: Alpinia vittata is a fast grower and can be used as indoor plant as long as a humid atmosphere is maintained. Remove spent leaves as they form and cut old canes to their base. 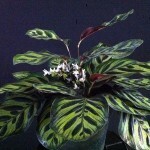 Light: Alpinia vittata thrives in medium light or filtered direct sunlight is best. 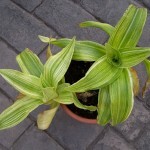 Kept in too dark position will reduce variegation and make the leaves greener. 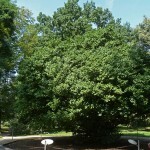 Prolonged direct sunlight can cause foliage to scald, brown or bleach. 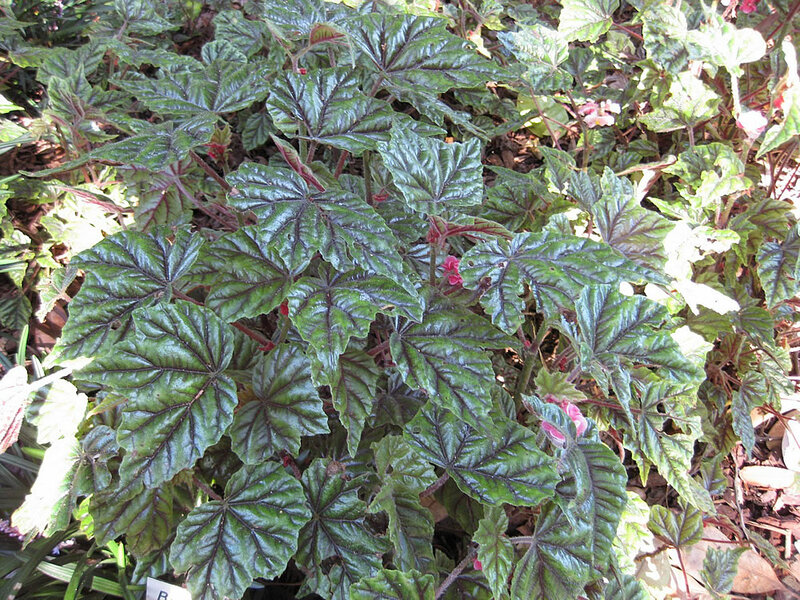 During the warm season these plants can be moved outdoor in a spot with partial shade. Bring the plants back indoors before the temperature drops under 15°C (59°F). Temperature: During the active growth period, the warmer the better – temperatures must never drop bellow 15°C (59°F). High humidity is essential; stand Alpinia vittata plants on saucers of moist pebbles throughout the year. 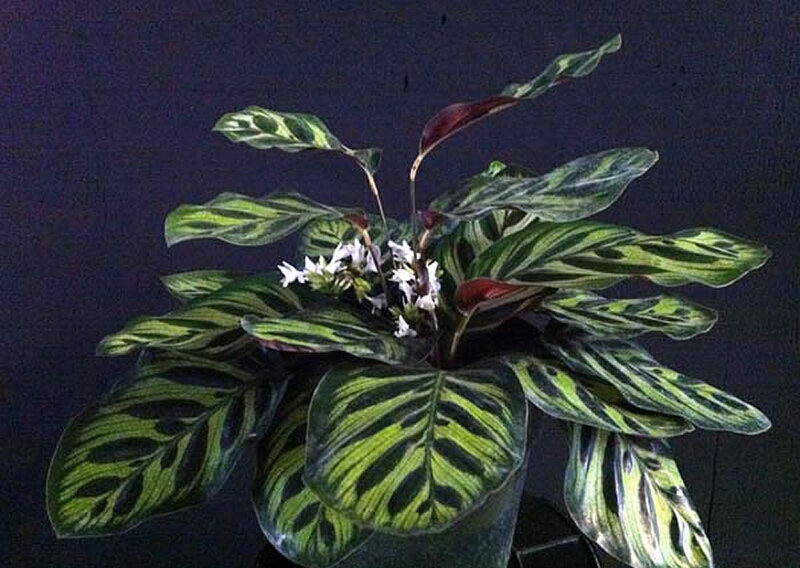 Watering: Correct watering is essentially important for the successful growth of Alpinia vittata plants. As soon as the rhizomes start into growth in early spring begin to water plentifully, as much as necessary to keep the potting mixture thoroughly moist. After the active growth period gradually reduce the quantity and water only moderately during the rest period. 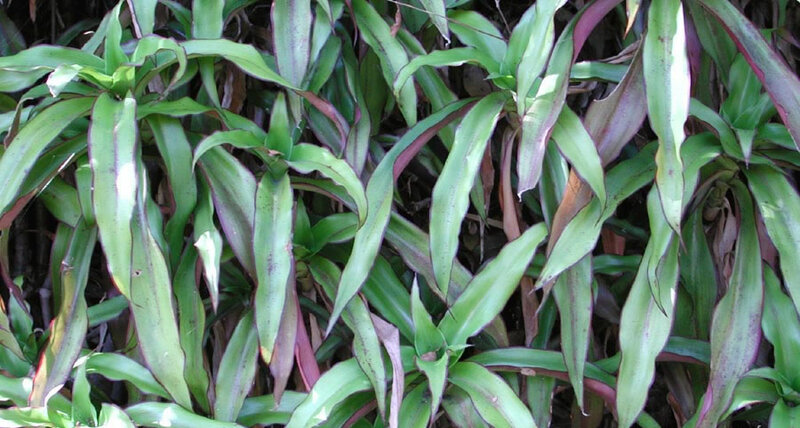 Feeding: Apply to Alpinia vittata a standard liquid fertiliser every two weeks from spring to summer. 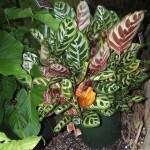 Potting and repotting: In mid-spring, transfer Alpinia vittata plants into a pot one size larger. Use a soil-based potting mixture with blood and bone at the rate of one teaspoonful per 15cm (6 inch) pot. Gardening: Alpinia vittata is best in tropical to sub tropical climates, but can be grown in frost free temperate areas in a warm spot. It can also be grown in a container. 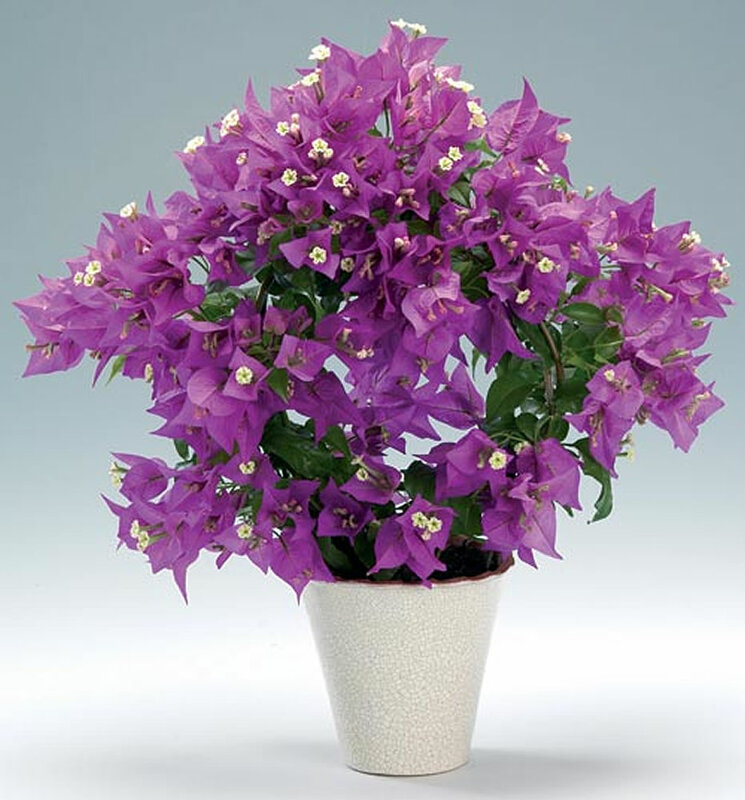 In cooler climates, it must be kept indoors or in a greenhouse over winter. This species has light frost tolerance. The tight clumps of tall slender erect stems will die back with freezing temperatures, but the rhizomes will sprout new foliage in spring. If grown in cold regions, the rhizomes can be dug up and stored indoors for the winter. Store them at 13°C (55°F) in dry pine bark mulch and then restart them in spring after frost danger has passed. 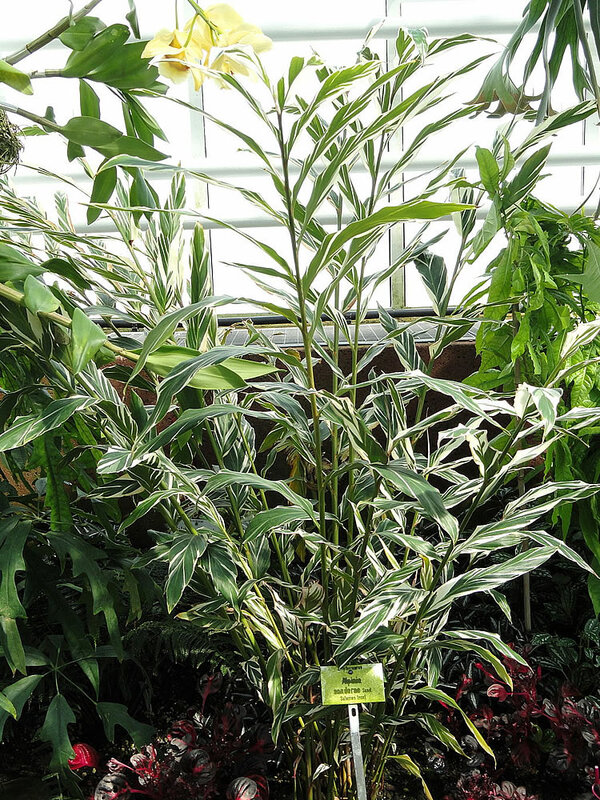 Because Alpinia vittata does not flower until its second year, it can only be enjoyed for its foliage in the cooler areas. These beautiful plants have a massive spread, so give them plenty of room to spread their wings. 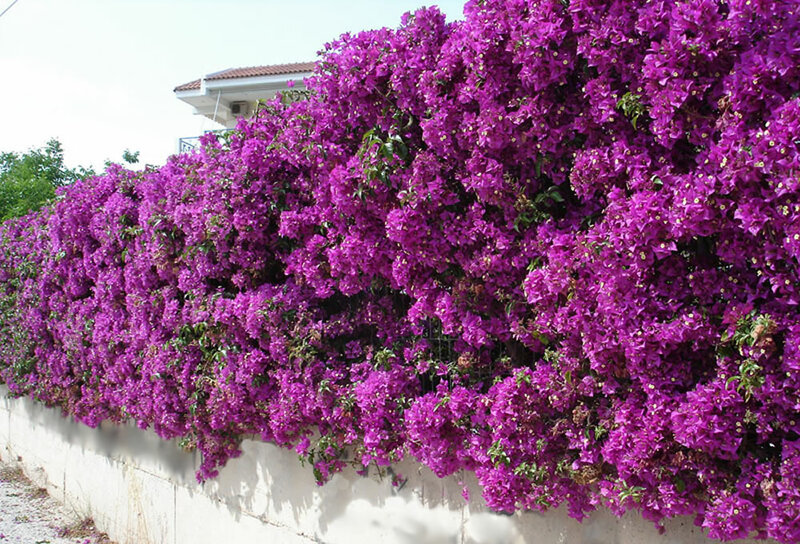 Place them 1.2 to 1.5m (4-5 feet) apart and allow at least 1.2m (4 feet) between these plants and the nearest shrub or tree. Alpinia vittata grow vigorously and where they spread to outgrow their allotted space in the landscape, rhizomes should be dug up split and replanted. 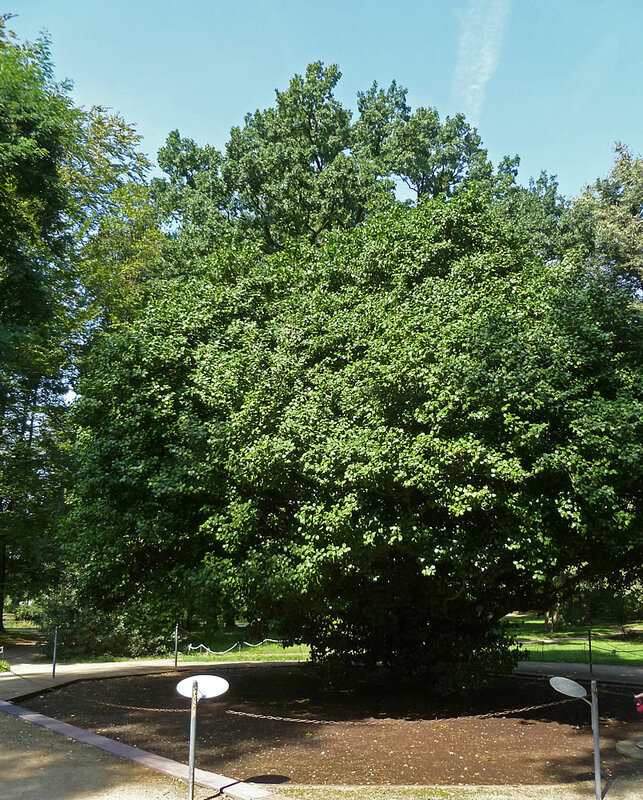 Also, the larger specimens should be sheltered from winds to prevent the leaves from tearing. The tallest stalks can be trimmed off to keep this plant to a lower size. Position: Alpinia vittata is not picky when it comes to its location in the garden – it can grow in areas that provide at least six hours of sun and bright light throughout the day but can also thrive in partial shady areas of the garden. But too much shade will reduce variegation and make the leaves greener. 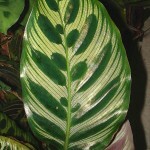 Prolonged direct sunlight can cause foliage to scald, brown or bleach. 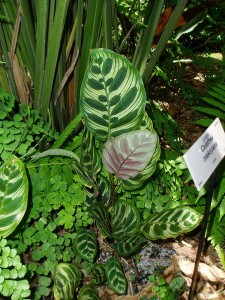 Soil: Alpinia vittata thrive in loose, but moist rich soil. A sandy soil that has a lot of organic matter is ideal. Before starting the plant, incorporate a layer of compost into it to promote soil moisture retention and provide nutrients. The soil should be mildly acidic (6.0-6.5 pH) to mildly alkaline (7.0-7.5 pH). In cooler areas, a thick layer of organic mulch might help protect the roots. The rhizomes should be planted as soon as possible. It is recommended to establish the plant in a pot before planting it in garden. 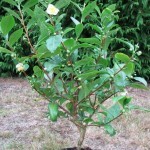 The rhizome should be planted with the top up, no more than 3-4cm under the soil. Avoid planting them too deep to prevent rhizomes from rotting. Also, freshly planted rhizomes need oxygen to grow new roots and will die if the planting medium is too dense or too wet. If planted in pots, these should be of sufficient size – at least 10 to 15cm (4-6 inch) wider than rhizome size. Keep the pots in a warm, sunny place. 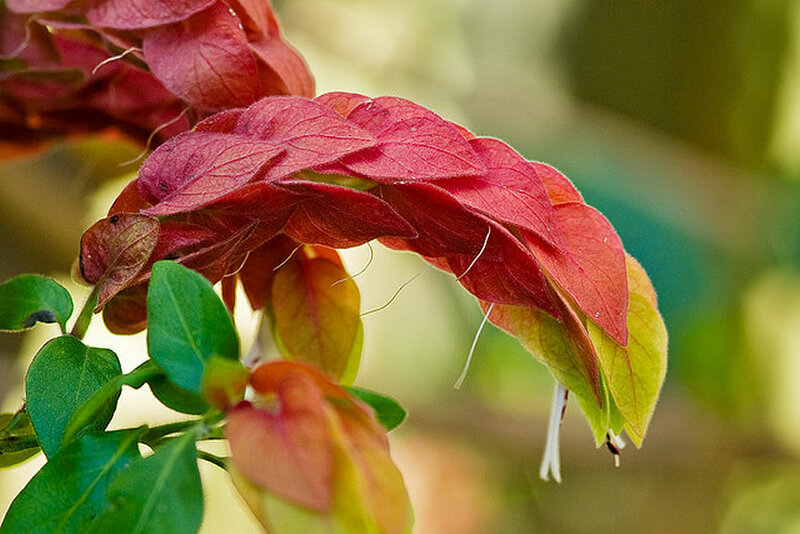 When leaves start to unfold the plants can be planted out – again in well drained soil. 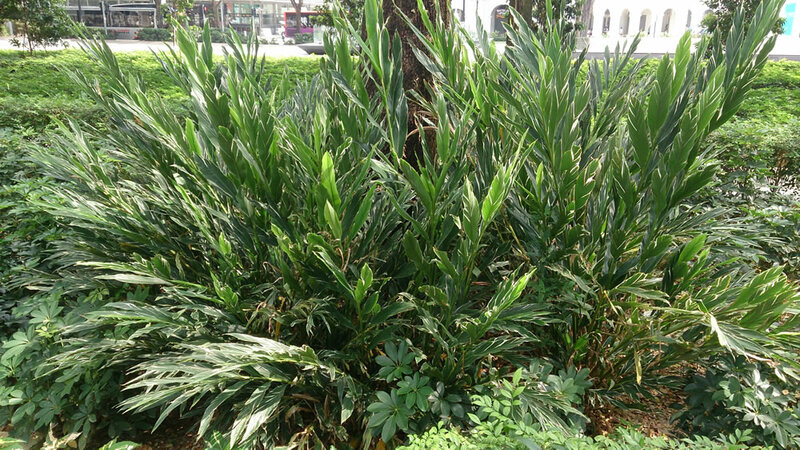 Irrigation: Although Alpinia vittata plants do not mind dry conditions, they will look their best with regular irrigation timed so that the soil has a chance to dry out between waterings. These plants are moderately drought tolerant once established. Water regularly, especially during the initial growing season when the roots are establishing. Avoid overwatering, especially during periods of cool winter weather below 10°C (50°F), as rhizomes are prone to rot. 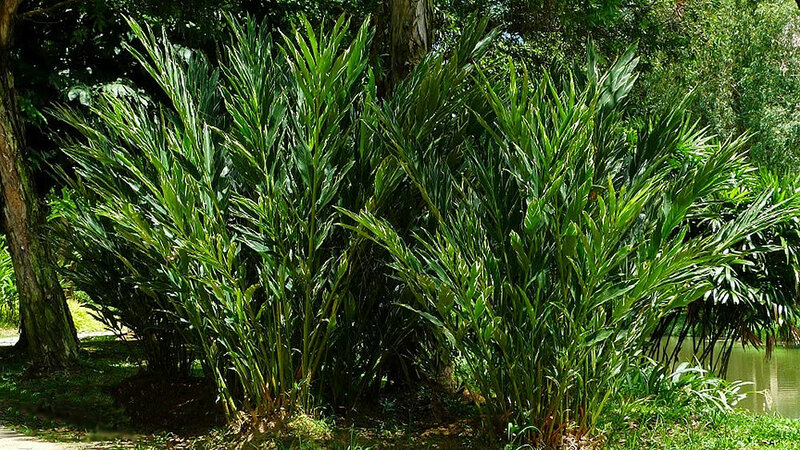 Fertiliser: Alpinia vittata will thrive with regular applications (3 times a year: spring, summer and fall) of a high potash (K) fertiliser such as a slow release 8/2/12 palm special. 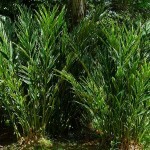 They require far less fertiliser however than palms and will fail to flower if too much is used. Fertilised plants require more water than unfertilised ones. 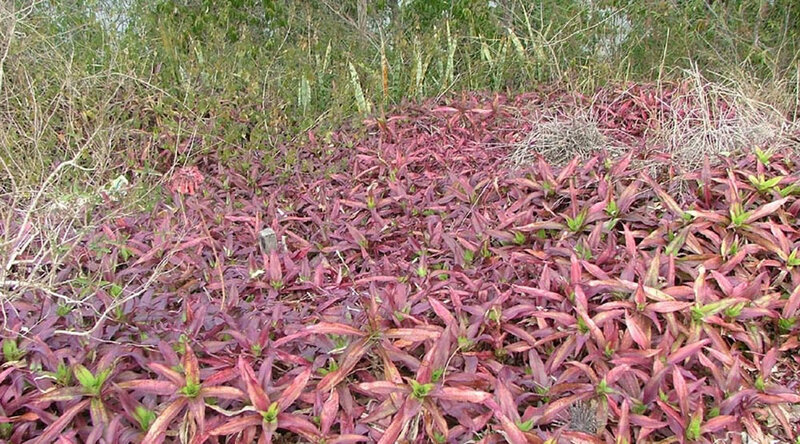 Propagation: Propagate Alpinia vittata by dividing overgrown clumps in late spring. These can be broken off or cut with secateurs. Pots of divided rhizomes should be kept in a warm, shaded spot for several weeks before being placed in their permanent position. 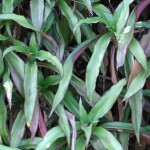 Alpinia vittata can be started from sections of rhizome in spring using a loose, airy but moist organic potting mixture. Make sure that they are not planted too deep – at most 2.5-5cm (1-2 inch). Avoid overwatering to prevent rhizomes from rotting. After planting, water thoroughly, then do not water again until soil is getting dry. Keep in warm position, evenly moist, but not wet, until shoots grow and leaves start to unfold. Problems: Generally, Alpinia vittata is problem free. 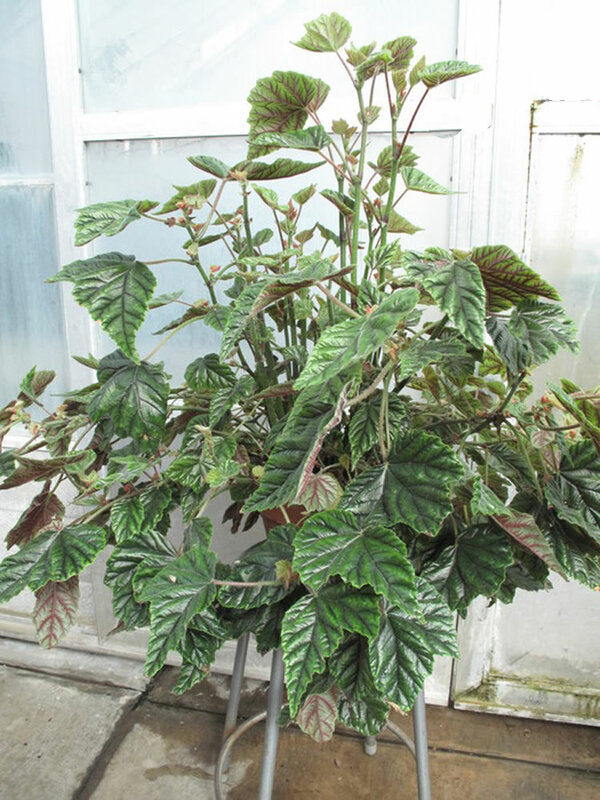 Red spider mite may infest these plants when are kept in dry atmosphere. The edges of the leaves turn brown if the plant lacks moisture. Treatment: Water the plants. Spread a thick layer of organic mulch over the soil around the plant to help promote soil moisture retention. Older leaves will appear pale with brown necrotic areas is caused by insufficient potash. Interveinal yellowing is caused by iron deficiency and distorted leaves by manganese deficiency. Treatment: Fertilise plants as recommended to correct trace elements, especially they are grown on limestone soils. 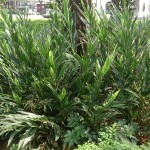 Companion plants: Alpinia vittata makes a sticking contrast when planted in landscape along with: Cordyline species, Schefflera arboricola (Green Arboricola), Nephrolepis biserrata cv.’Macho Fern’ (Macho Fern), Brugmansia species (Angel’s Trumpet), Strelitzia nicolai (White Bird of Paradise), Tibouchina heteromalla (Silverleafed Princess Flower) and Agapanthus species. 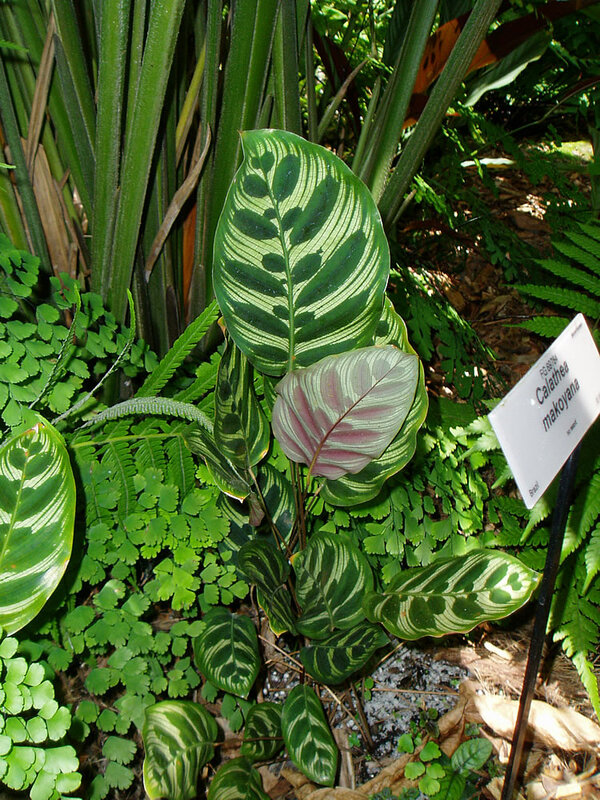 Note: Alpinia vittata is often confused with Alpinia zerumbet cv. 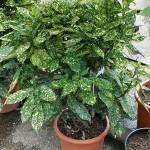 Variegata. They have different flowers (Alpinia zerumbet cv. Variegata has shell-like flowers, beautiful flowers used in exotic bouquets) and different hardiness zone (again Alpinia zerumbet cv. 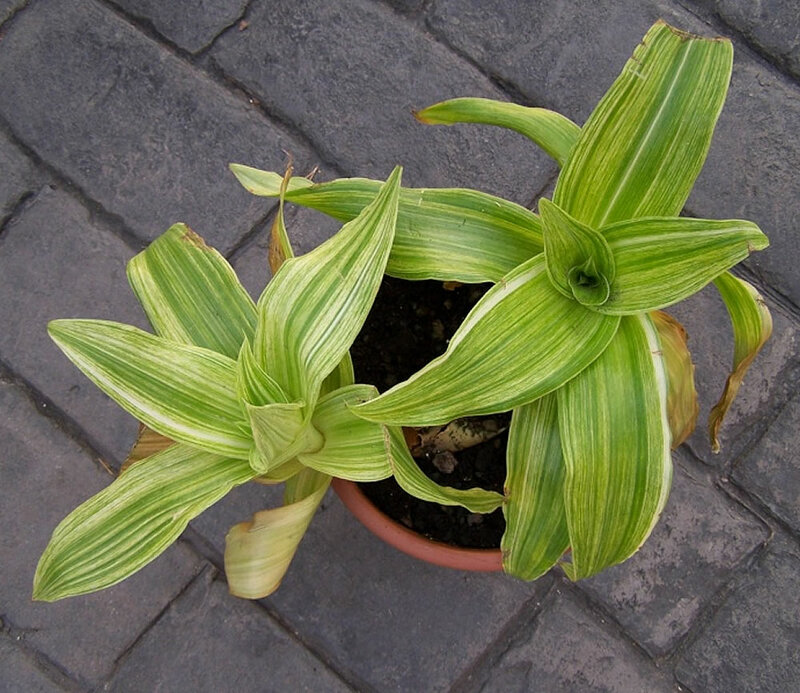 Variegata is a harder cultivar). The size is again different. 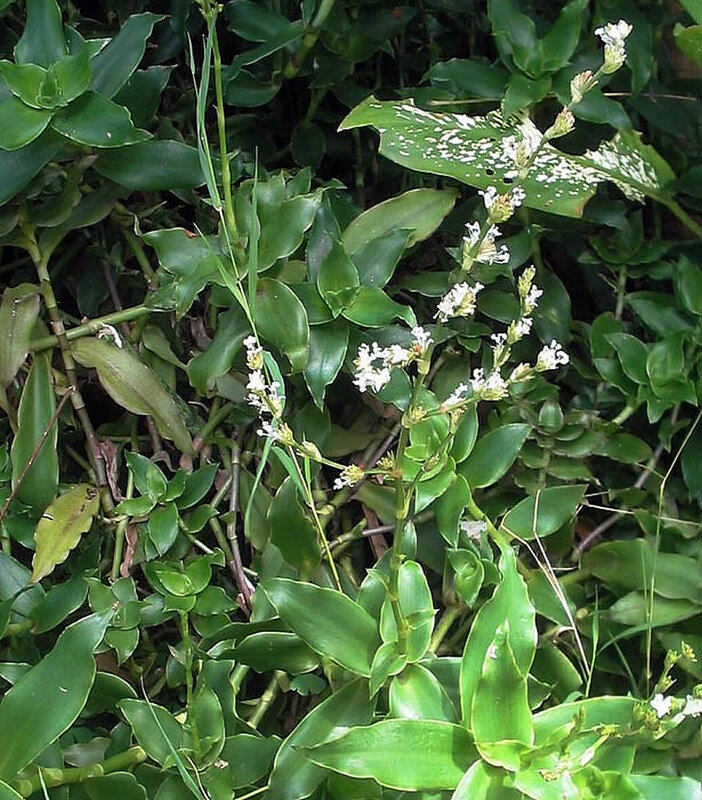 These two species also share sometime their common name as ‘Variegate Ginger’. 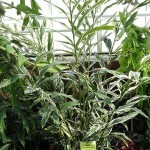 Grow Alpinia vittata for its beautiful foliage. Uses and display: Alpinia vittata is used in tropical landscapes for filling borders, in containers or as building foundation plantings. In cold climates, it often serves as a seasonal container plant for the patio. The foliage can be cut and used in fresh flower arrangements. 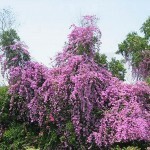 It makes an excellent landscape plant that is easily cared for. Great for mass plantings and border areas. 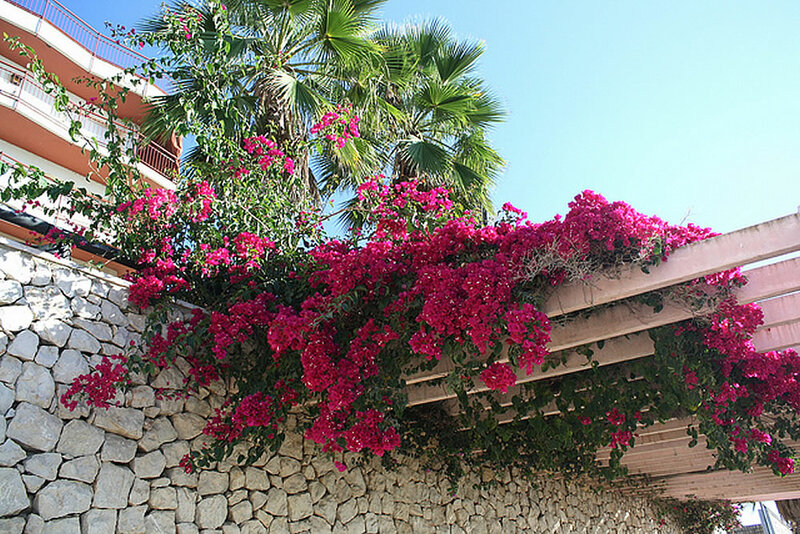 It works as a surround for trees or palms, a filler for a corner bed or an anchor plant for a mixed garden. 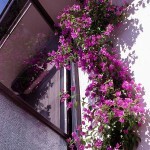 It is suited for tropical, oriental and contemporary designs gardens. This species in drought-tolerant, therefore it is suitable for xeriscaping. Alpinia vittata can be used in landscape in many ways such as: single yard specimen, center of a circular drive, large accent for a mixed bed, backdrop for smaller plants, in front of tall green shrubs, corner-of-the-house accent, pool cage plant (for a large bed), surrounding a palm tree or as an understory plant among large trees.